Weakness in an exchange traded fund indexed to the Dow Jones Transportation Average is sending a warning signal on the market, some analysts say. The ETF’s underperformance could simply reflect higher oil prices, but may also be broadcasting a pause in the stock rally. “The Dow Jones Transportation Average and the iShares Dow Jones Transportation Average Index ETF (NYSEArca: IYT) that tracks it have just about completely decoupled from the broader market,” writes Brendan Conway at Barron’s. The Dow broke through 13,000 this week and is trading above the 2011 highs. However, Dow Theory adherents want to see the breakout confirmed by the transportation index. The iShares Dow Jones Transportation Average is up 2.2% so far this year, while the S&P 500 has tacked on 8.3%. The iShares Dow Jones Industrial Average ETF (NYSEArca: DIA) has gained 6.1%. “You can chalk up some of the weakness to oil trading at $105 a barrel amid fears that Iran will disrupt global supplies. But you also have to figure that some of the weakness simply owes to doubts that highly cyclical stocks like trucking and airlines can keep up this year’s torrential gains,” Conway wrote. The transportation ETF is testing its 50-day simple moving average, which has provided strong support since the October low in stocks. 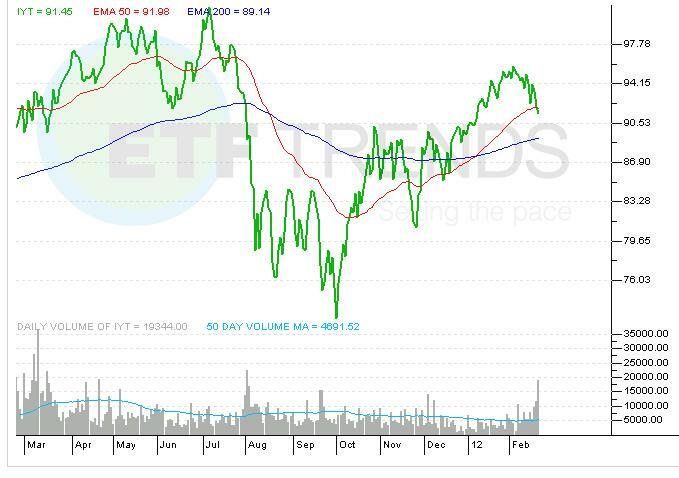 Other transportation-related ETFs such as Guggenheim Shipping ETF (NYSEArca: SEA - News) and Guggenheim Airline ETF (NYSEArca: FAA - News) have slowed recently on the spike in oil prices.